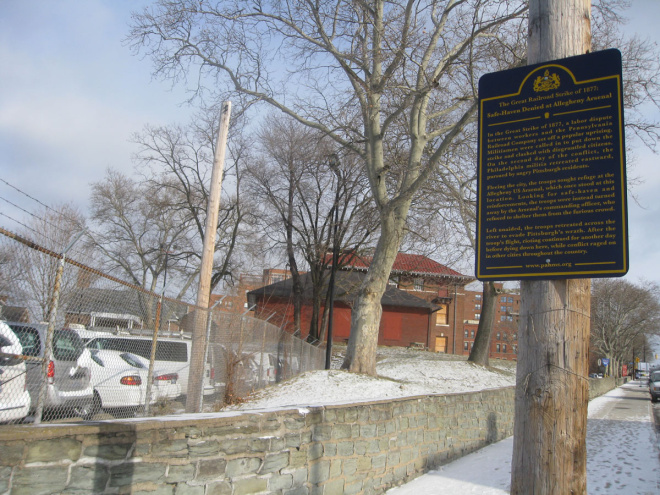 In 1997, the Pennsylvania Museum and Historical Commission placed an officially sanctioned historical marker outlining The Great Railroad Strike of 1877 at the foot of the 28th Street Bridge in Pittsburgh. Its few lines offer a concise -- some would say oversimplified summary -- of the US's first large-scale labour uprising. 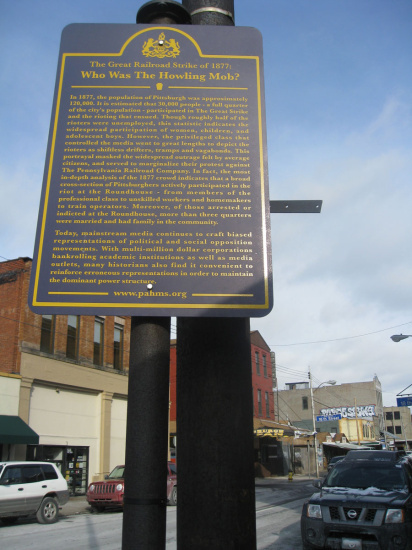 A few years later, a group of anonymous artists and amateur historians organised themselves as the Howling Mob Society and erected plaques about the other side of the story throughout the city. For more information on the signs or on the Howling Mob Society, follow the links to the other images or read the essay below. 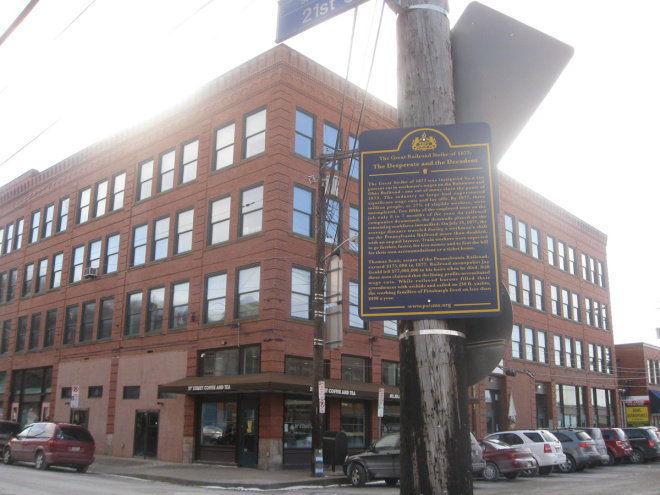 The scavenger hunt for the guerrilla markers begins atop Penn Avenue, near 39th Street, and overlooks the Strip District, where we find an extended text about the second day of the conflict. While fleeing the city, the troops sought refuge at this location, formerly the Allegheny US Arsenal, but were refused shelter. Today the sign offers a history lesson for those lingering beside an active bus stop waiting for a ride downtown. Located at the gateway to Lawrenceville, a blue-collar neighbourhood full of abandoned storefronts and artist-owned row homes, the triangle at the intersection of Penn Avenue near Butler Street is affectionately known as 'Doughboy Square' because of its sculpture of a US Soldier during World War I. According to local legend, the doughboy would have been no match for 'Pat the Avenger'. As the Philadelphia militia retreated up Penn Avenue, Pat emerged from doorways and alleyways, methodically taking fire with great accuracy. It is believed that Pat killed several retreating militiamen, though no one has been able to confirm the folk tales, or the man's identity. Over a fifteen-year span in the late 1800s, America's web of railroad tracks connecting urban centres tripled in size. Construction seldom considered the best interests of citizens and often separated the residents from the hearts of their cities. The sign states 'Thirty-five-ton locomotives barreled down densely populated streets that ten years earlier saw only foot traffic and horse-drawn buggies. In 1876 alone, the Erie Railroad reported 61 deaths and 53 injuries among non-railroad workers.' The Strip District, where the sign is located, was once home to iron mills, foundries and glass factories, which have now been transformed into luxury loft spaces. The site of this plaque, on the same post as a railroad crossing sign, and set between a high-end cigar bar and a renovated industrial building, epitomises the ironies of industrialisation and the neighbourhood's urban renewal. Who Was the Howling Mob? Located just around the corner from Primanti Brothers sandwich shop, one of the city's most well-known attractions, 'Who Was the Howling Mob? ", is the marker that likely receives the most foot traffic. It tells those in the long Primanti lines how, in 1877, a full quarter of the city's population -- including women, unemployed men and even children -- participated in the Great Strike, and explains the rioting that ensued. 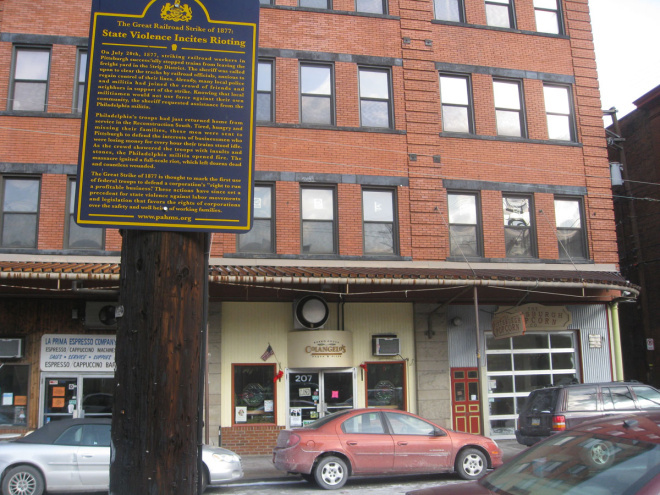 The marker illustrates how the media of the day, heavily influenced by the 'robber barons', went to great lengths to marginalise the broad cross-section of striking Pittsburghers, casting them as drifters, tramps and vagabonds, and discusses the influence of major corporations in the mainstream media. Of those arrested, many proved to be upstanding members of the community who had become outraged at having been marginalised by the privileged classes. The signs are secured with a range of methods, from simple bolts into existing posts and poles, to the more official looking industrial clamps. None of the signs employs the same painted blue cast-iron dowels that the State's officially sanctioned markers use. 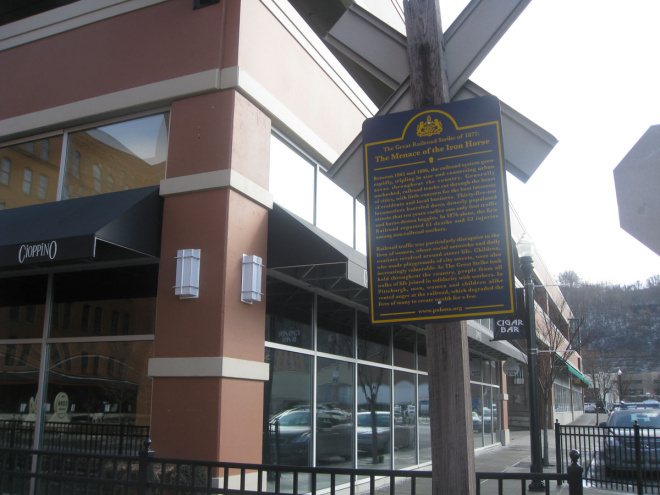 This marker is located at the corner of 21st Street and Smallman Street, across from the Society for Contemporary Craft. It focuses on the financial circumstances that contributed to the uprising of the workers on the Baltimore and Ohio Railroad. As railroad companies downsized, laid off workers, demanded longer hours and cut workmen's wages by ten percent, the monopolists who owned the railroads lived lavishly. Thomas Scott, the president of the Pennsylvania Railroad, earned $175,000 in 1877, while the working families of Pittsburgh lived on less than $400 a year. 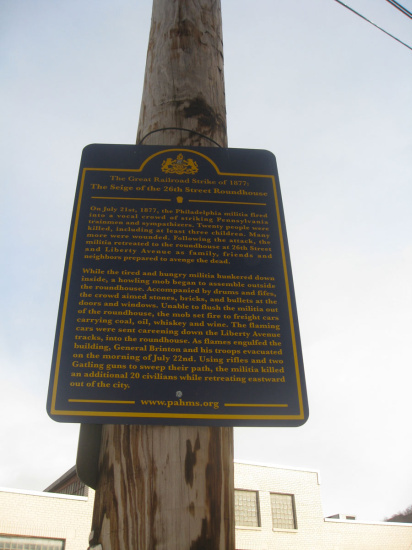 Located on 26th Street, between Penn Avenue and Liberty Avenue, this marker clarifies the tragedy of 21 July 1877. 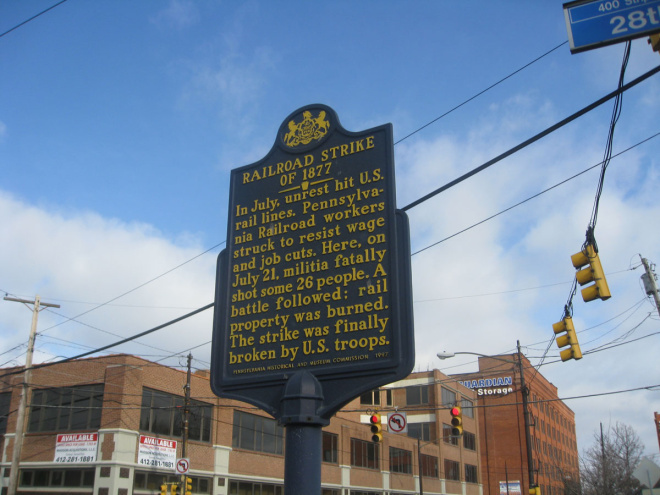 Tired, hungry, and battered from thrown rocks, the Philadelphia militia opened fire into a crowd of striking trainmen and sympathisers, killing twenty, including at least three children, and wounding many more. As the militia retreated to a roundhouse at 26th Street and Liberty Avenue, the citizens prepared to avenge the dead. The mob turned freight cars carrying coal, oil, whiskey and wine into fireballs that they sent careening into the roundhouse. As the building was engulfed in flames the militia evacuated, clearing the crowd with their Gatling guns, which left an additional twenty civilians dead. In 1877, the Pennsylvania Railroad Company (PRR) was the largest corporation in the world. Located across the street from Penn Station, where Pittsburghers have relied on trains since 1903, this marker takes stock of the damage done during the riots. In total, 125 locomotives, 3,500 rail cars, two roundhouses, the Union Depot and a grain elevator were destroyed. Thomas Scott, PRR's 4th president, claimed responsibility for neither the damage to the lives of his employees, nor the community. Allegheny County, which Pittsburgh is part of, was forced to absorb $4 million in property damages, while the PRR did not a spend penny. The Great Railroad Strike of 1877 was the United States's first large-scale working-class insurrection. Impoverished railroad and steel employees from Baltimore, Pennsylvania and West Virginia to St Louis in Missouri, refused to accept a further round of wage cuts while profits were on the rise. The strike's work stoppage halted half the country's rail traffic. In Pittsburgh, where anger boiled over to violence and the majority of the industrial Strip District was burned to the ground, stone-throwing protesters were met by six hundred National Guard troops. (The state, with the blessing of President Hayes, determined that local Pittsburgh militiamen were sympathetic toward their neighbours' cause, and sent for troops from Philadelphia to quell the riot.) When the troops resorted to Gatling guns, a rapid-fire precursor to the machine gun, and bayonets, 26 strikers were killed in just minutes of chaos. Many newspapers and publications of the time sided with the railroad businesses, ignoring the workingman's issues that motivated the rebellion. Deliberately playing on xenophobia, most accounts accused the strikers of being foreign agitators, primarily of German descent, while those who unionised were branded as communists and blackballed from future employment. The incomplete historicisation of this event has recently been taken up by a group of six anonymous artist-activists and amateur historians. Dissatisfied by a lack of regional understanding of the strike, and the way it has been taught in schools, the Pittsburgh-based The Howling Mob Society (HMS) -- a name taken from a Harper's Weekly headline of the time, which depicted the striking dissenters as lawless men bent on a reign of terror -- spent nearly a year investigating voices that have been overlooked. Conscious that the accounts had been primarily written by media outlets owned by the economic magnates, like Andrew Carnegie, Henry Clay Frick and other 'robber barons' of the day, they offered a counterpoint, by way of ten historical markers placed within the public realm. The HMS guerrilla campaign began early on a Sunday morning in November 2007 when the collective drove to places where the insurrection had unfolded: the Strip District, Polish Hill, Lawrenceville and the edge of downtown across from Penn Station. The members attempted to appear as official as possible, boldly blocking roads with cones and donning yellow construction vests. (Their methods are, in many ways, a nod to the 'accidental audience' methods of REPOhistory, who utilised illicit metal street signs to distribute 'other' histories during the 1990s in New York City.) The signs were fastened securely to telephone poles, a traffic light, a railroad crossing sign, and, in one case, a previously unused metal post. At first glance, there is little difference between the signs sanctioned by the Pennsylvania Historical and Museum Commission and their Doppelgängers; the Howling Mob Society mimicked their blue and yellow enamel colour scheme and overall shape. The state's signage is made of visibly thicker aluminium, with the writing cast into both sides, while the lettering on the rogue signs has been printed on vinyl stickers. A sly modification is found in the Pennsylvania coat of arms as the two-harnessed black horses have been replaced with silhouetted wildcats, a sign of the radical workers' movement. The State's escutcheon has been altered from the original clipper and plough to a burning locomotive and a glowing torch lighting tracks ablaze. Of course, at first glance we don't see this difference. And the texts in the HMS markers are much richer in content and complexity, excavating and magnifying a two-sided story. 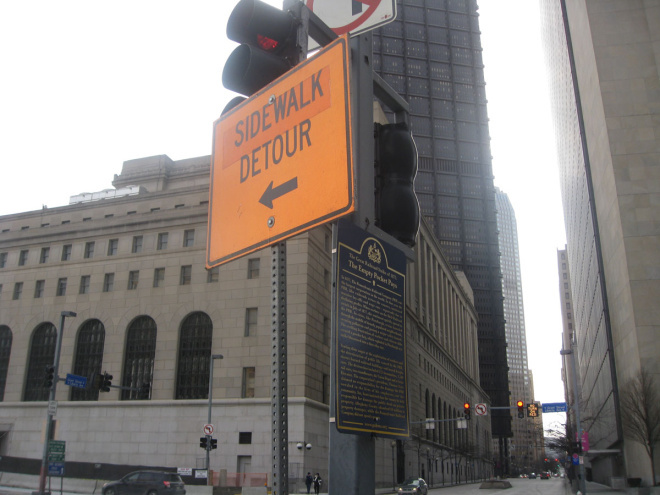 On a recent blustery weekend in Pittsburgh I spent an afternoon zigzagging between the neighbourhood's three main thoroughfares on a scavenger hunt for the eight signs that are still there. Within six months of the initial installation, two of the signs were removed, and as the work is in the public domain, the HMS and its admirers fear it will one day totally vanish. Most of the signs are near bus stops, on sidewalks where people linger. 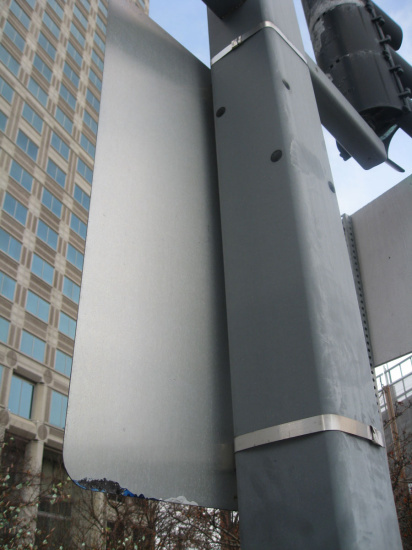 Distinctly pedestrian-friendly, they are often placed with their blank silver backs facing out towards the street. Given the project's unauthorised status and the city's reputation for prosecuting street artists, the HMS were particularly worried when police announced that they would be doing a clean sweep of certain neighbourhoods during the summer 2009 G-20 summit, but none was taken down. There is a nice irony in the fact that the signs have remained overlooked by those who enforce the defacement of open spaces. The HMS message is, for now, accessible to an observant public, but does this project succeed as an educational device? Do citizens read the signs? A decade ago the Strip District sat as a Rust Belt hinterland of empty warehouses and a collection of bric-a-brac purveyors. Lately, rapid gentrification has resulted in reuse of buildings where blue-collar enterprises once stood. The benefit of the reshaped community is the ability for the signs to communicate with and inform a different, more prosperous constituency. An interesting juxtaposition is staged on Railroad Street. A sign positioned directly on train tracks between a posh cigar lounge and a cork factory turned loft building describes unregulated railroad traffic zipping through the city's core, with no concern for residents. It's doubtful that the high-end properties today would be so valuable if the trains were still rolling. My favourite location for one of the faux signs is in Doughboy Square in Lawrenceville, where I discovered a local legend in the sign titled 'Pat the Avenger Returns Fire'. Though firsthand accounts can be difficult to confirm, legend describes Pat as a marksman who is believed to have killed several militiamen. Perhaps HMS is offering an identity to the Square's namesake, a towering sculpture of a lone infantryman, perched up high. 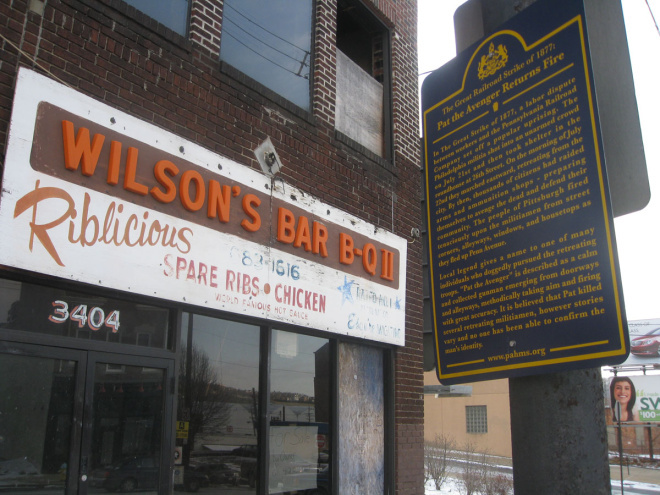 The sign sits at the convergence of a traffic triangle, adjacent to a long row of abandoned buildings, including the deserted Wilson's BBQ Riblicious. Pasted in a long stretch are Shepard Fairey posters, which are currently blanketing the city in correspondence with his solo survey at The Andy Warhol Museum. While using different tactics towards the same goals, the coexisting artworks turn private into public, reappropriating contested sites and contested histories into open-air classrooms.